The European Travel Commission has recently published its report about travel Trends and Performances, you can read the entire document here. 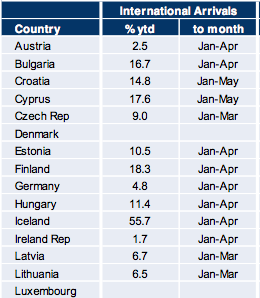 As mentioned in the report Europe has experienced a rapid growth in term of arrivals, especially from foreign tourists. Between January and May in Ireland, the International Arrivals are increased 2% compared to the same period of the previous year. This number seems encouraging but is one of the worst performances throughout all the country analysed. Recently here at b-smark we concentrate our efforts focusing on the Chinese outbound tourism in Ireland. In the European report, we can see how this topic is very hot in the travel market. Chinese are started to travel but just a few of them are traveling in Europe. They concern about are several topics but the one described by the European Commission is the lack of direct flights from China to the European countries, in fact, an important example provided is the one regarding Finland that after the setting of a direct flight the arrivals have increased by 81%. With our studies and research on #DestinationPersonality, we are trying to understand how a place is perceived in travelers’ mind and how the travel motivation can be used to attract more people to a specific location. We are currently combining the two pills saw below and pointed out by the European commission in one of our projects: the Ireland’s necessity to increase the arrivals and the Chinese tourists outbound concerns. The project is aiming to profile Ireland´s destination image from Chinese tourists’ point of view, targeting some tailored actions and optimization with regards to the customer experience for this audience of tourists in Ireland.